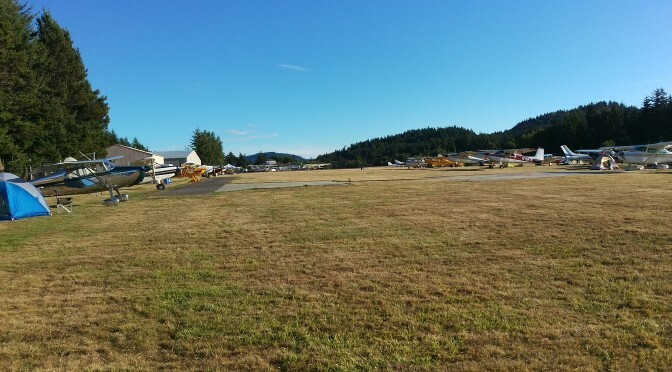 Orcas Island’s airport (ORS) hosts an annual fly-in every August, hosted by EAA Chapter 937. Ann and I visited yesterday evening. These island airports are busy with smaller aircraft, as package carriers (UPS, FedEx) fly parcels in at ORS using single engine Cessna Caravans . The largest plane I’ve seen was a Lear jet. 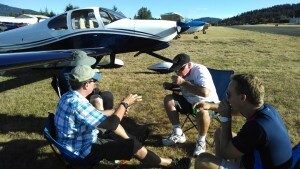 On any given summer weekend, you can find fly-in campers at this airfield, with tents pitched next to their aircraft in the grass tie-down area. The field is very hospitable to the backpack flyers, and has provided a restroom with a hot shower (donation encouraged). It’s charming to see one or two of these planes tied down with a colorful nylon tent pitched under the wing. 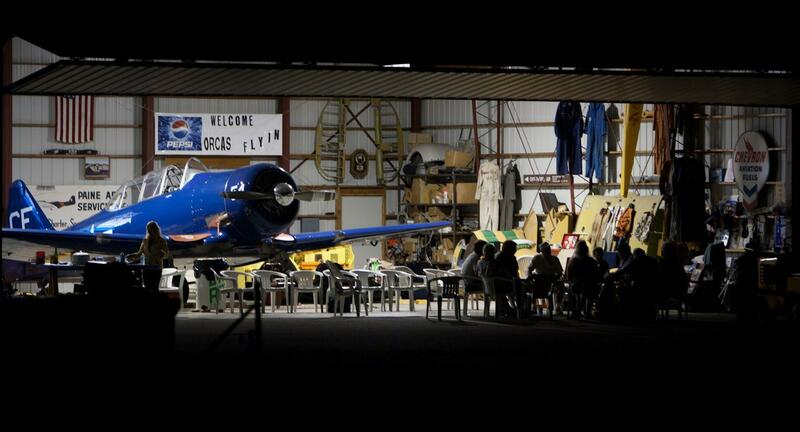 Camping year ’round is very laid back for a general aviation airport, but ORS goes one better: A few of the aircraft owners have set up their hangars as ad hoc get-away “cabins”, with the means to fix a meal, or comfortably pass a night in. It’s a busy airport in its own right, but the annual Fly-In fills the field up with numerous beautiful and some rare birds, as well as an enthusiastic crowd of pilots and co-pilots. Tents are everywhere, and confabs of flyers gabbing in circles of folding canvas camp chairs in-between them. Four guys from an EAA chapter east of Tacoma sat in the midst of their Vans home-built project planes (three RV-4s and an RV-10), sharing salsa with tequila shots. I traded jokes with them, and was offered a shot in turn (cheerfully declined), and bite of salsa (peppery and piquant). Strolling with Ann among the gathered pilots, it occurred to me that these people were one of my natural social tribes. I could understand and appreciate the eavesdropped conversations, and could comfortably join in on many of them. A barbecue buffet was offered for a very reasonable donation in one of the open house hangars, and we feasted on cheese burgers, sides and salad. We hunkered down with paper plates piled high, sharing our table with a old flyer from San Juan Island . He spoke of learning to fly between these islands 50 years ago, landing and taking off from pastures more often than from runways. All in all, I’m very glad we chanced upon the annual Fly-In for its first evening. We lucked into a warm and gracious meal among strangers who, through the common interest of planes and flying, weren’t really strangers at all. ‘The Gullwing Odyssey’ : An audiobook fantasy! The Oatmeal Twitter Spelling Test! Share book reviews and ratings with Elliott, and even join a book club on Goodreads.